Throughout most of November I was sick so I neglected my regular posts. In addition, it seemed as though far too many American voters just don’t care enough about what was and is happening and who continues to influence Congressional members (for example, per Pew Poll results (pdf): 61% of those polled have never heard of Grover Norquist). It’s doubly hard to maintain a positive attitude and seek to change the national dialog when so many voters don’t have a clue as to what is going on and don’t seem to care. Nevertheless, I will continue to try because I do care about my country: the country my ancestors helped found and defend for nearly 300 years. So, here’s my editorial of the day…and maybe the week. Regarding the upcoming debt ceiling fight that Senator Graham (R- SC) announced this week, I’m sure Republicans believe that Obama will give in again rather than risk the nation’s credit rating and default on the debt as he did last year. However, given Obama’s recent sharp rhetoric to the nation’s business leaders, he’s very likely to allow the GOP to shut the government down rather than give in to them. As a result, the interest on the debt and the military will be paid. Beyond that, who knows. All other payments will depend upon how much existing and incoming cash exists for any other payments. Further, it’s possible interest rates on the debt will increase which will exacerbate the debt situation, and defaulting on the debt – or even putting the debt in jeopardy of default – will put our national ability to retain the dollar as the world’s reserve currency at risk. Being the world’s reserve currency gives the US enormous latitude in cheap borrowing costs (safe haven for investments) that other nations simply do not have. China has been lobbying the BRICs for the last couple of years to end the dollar as the reserve currency in favor of another currency, presumably theirs. Just think how much more leverage a debt default will give China in its arguments against the dollar…and the US. Nevertheless, once the GOP begins feeling the heat from their various constituents and donors as well as from the nation’s CEOs, they’ll back off and raise the debt ceiling. But by then the damage will already have been done to the nation’s credit rating as well a having put another knife in the heart of the GOP. 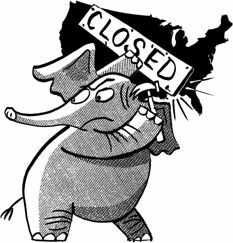 For those of you who believe that ending the GOP control of the House in the next election is eminent as a result of their intransigence and, frankly, economic stupidity, let me remind you of Republican gerrymandering in 2010. That gerrymandering will enable the House to remain in GOP hands until at least the next census in 2020 unless many of those GOP controlled districts suddenly turn blue. The only way to turn those gerrymandered GOP districts will become blue is for the Dems to have better policies and policy arguments that address the needs of ordinary middle income voters (jobs, income security, opportunity, economic growth, etc.) while at the same time putting our fiscal house in order. Right now, the Dems need to focus on creating a new progressive movement to meet the challenges of the 21st century. Globalization is not going to go away, nor should it. Globalization has caused billions around the world to rise out of poverty. That’s a really good thing that Dems should applaud. Besides, unless the US wants a global trade war, it just ain’t gonna happen. 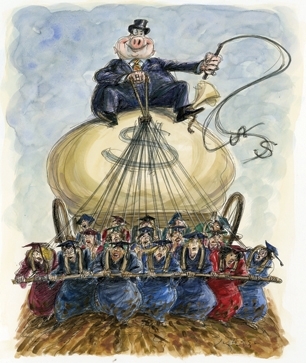 However, the Dems can create policies that address the immediate and long term challenges of globalization via better education (see Finland and Singapore, for example); a tax code that is fair both vertically and horizontally including eliminating much of needless spending on legacy industries; an improved patent system that enables/fosters innovation rather than suppresses innovation (see Ford vs owners of the Selden Patent); a reduction in the financialization of the US economy through better, more effective regulations and rules that puts (as in rewards) capital to work in the real economy rather than in speculation and short term investments/trading; and rebuilds/renews our national infrastructure to compete in the 21st century, and a host of other policies that encourages higher wages which make income subsidies unnecessary and irrelevant. Meanwhile, Dems should push to reform the federal government to streamline it and make it more efficient. For example, think about the DHS for a moment. Has the DHS made the nation’s security branches more effective or efficient? Have the many national security branches worked together better and more effectively? Has the monies allocated to DHS over the last 10 years been effectively and efficiently spent – or has Congress doled out the cash in its usual inefficient, vote getting, pork laden manner? Our federal government is based on an early 20th Century model that has grown exponentially while not becoming more efficient or effective. Obama spoke a couple of years ago during his State of the Union message about this problem and asked Congress to help/authorize him collapse departments and consolidate similar programs. Congress did nothing in response. Nothing! Because doing so means loss of generous donors (“Mr. CEO, we’re thinking about changing the law…”) as well as loss of individual, personal power via chairmanships and other important committee positions. Yet, the GOP felt perfectly comfortable in the last election attacking Obama for not making the federal government more efficient by consolidating similar programs (i.e., employment programs); yet, only Congress has the power to do so since Congress took the power to collapse department and consolidate programs away from the President many decades ago. Beyond these suggestions, Dems need to better communicate their ideas and policies. Essentially, they need a wordsmith like Frank Luntz on their side of the political spectrum. It’s not enough to have better policy ideas if they cannot communicate how those ideas will make lives better for the broader populace. Superior communications ability is what caused FDR to win all but about 7 electoral votes in his second election. Moreover, Dems need an antidote to the Tea Party. It’s not appropriate to winning elections to deride the Tea Party as no-nothings or radicals or whatever. You don’t win elections by deriding and denigrating nearly half the voters. Dems, across the board, and their supporters must understand the motives of the Tea Party and their supporters and build communications scripts that speak to their needs and fears as well as their hopes and longings. Deriding them does nothing but create more antagonism and stubborn hatred. Instead, answer their fears with understanding and assurances that we all, from whatever party allegiances, seek the same goal of a sustainable and prosperous country where everyone can find or achieve his/her dreams. In addition, Dems need to form a broad coalition of activists, akin to the Tea Party, to influence not only the national conversation as the Tea Party has but to influence primaries, even in Red State gerrymandered districts. Finally, Dems need to work diligently to remove money from politics. As long as both sides of aisle depend upon corporate and special interest funding via lobbying dollars and PACs and hugely funded outside organizations (501(c)4s) like American Crossroads or Americans for Prosperity, nothing will ever change for the good of the American people at large. Right now, both sides of aisle award the highest fundraisers with chairmanships and other committee perks. Not on expertise or knowledge of the subject matter. (Thanks, Newt! We, the American people, really needed your putting fundraising dollars, in the mid 90s, ahead of subject matter knowledge and expertise.) But rather on their ability to fund raise. 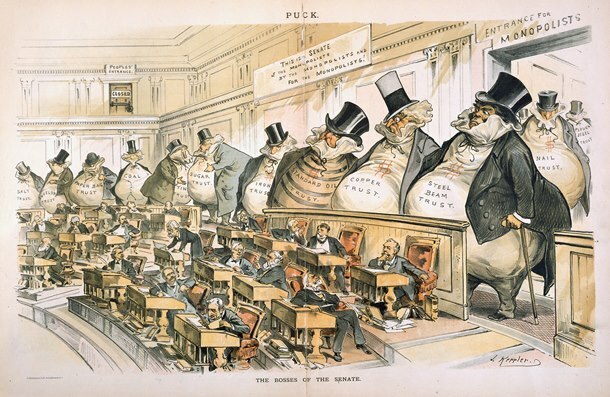 The current scenario is not that much different than the early 1900s “Millionaires Congress” in which Congressional candidates and members were openly bought by millionaires. Even McKinley’s presidency was purchased by our Gilded Age millionaires. Our founders expected Congress to reflect the will of the people – their voting constituents – rather than those who through large donations buy and write legislation and seats. Yet, it’s not enough in this era of partisan politics to denounce via hyperbole our modern days millionaires (Koch Bros, Addelson, etc. ), Dems must explain – clearly, succinctly and simply – why the ideas of those groups and people are wrong for America at large…and how their policy ideas will harm/hurt average American families – in which Dems very much believe – in our global economy and in our local and state communities. Lastly, Dems must communicate a better understanding of the rising libertarian movement within the GOP. Even though Friedman’s neo-liberal financial movement gained wide support throughout the country, it’s fallacious underpinnings have begun to crumble worldwide, especially in the BRIC countries. Moreover, classical libertarianism, as espoused by Heyak, is not opposed to many Dems policies, such as retirement security (i.e. social security) and national health care. Hayek, in a published paper (pdf) for a Chicago audience, stated that he was not a conservative but a classical liberal, meaning he did not look back at the past but towards the future and all it might hold. In addition, he stated that many of the changes which the future might hold would necessitate the state providing income security (i.e, unemployment benefits and retirement) and national health care to the masses. He saw these benefits as not evils but as beneficial and appropriate for social stability. Dems should be proclaiming what Hayek said as akin to their philosophy along with libertarian ideology against perpetual war and loss of individual freedoms per the NDAA and Patriot Act. True libertarians, not the Ayn Rand Koch Bros version, are natural allies of Dems, if only Dems would wake up to that fact. Where Hayek and Dems differ is on regulation. Hayek lived during the rise of Communism and feared Stalinism, with good reason. But Stalin’s – and even Mao’s – Communism was defeated; the modern state is not going to now or ever control the means and ownership of production. The new free market state must fear, instead, the ownership of production and innovation by the few powerful. And this is where Friedman’s policies appear to break down because he did not address, in the larger public economic context, the rise of economic and political powerhouses to buy and shape policy that control the societal benefits of the larger political audience – the average voters. Hayek, while he was ultimately wrong, and yet right in his fear regarding the issue of Communism and Socialism, given the world’s turn towards free market capitalism, was an important voice of that era and, thus, his support for income security and health care should also provide mutually important points of discussion among Dems and true libertarians. Moreover, an alliance with those young anti war-forever libertarians just might break the back of neo-con Republicans at the ballot box. Dems are not the party of forever wars or American imperialism. That ideology is a Cheney, et al, belief. It is not traditionally American nor does it reflect traditional American values. As a result, Dems could, if they used their powers of persuasion and understanding, move those young anti-imperialistic libertarians from the GOP into the Dem column, especially if Dems, as a policy platform, also openly promoted fair, open and honest financial industry dealings. As I said, Dems need to create a new Progressive Era with entirely new policies that meet the challenges of a globalized 21st Century while reassuring average middle and working income voters that their voices are being heard and that the nation is becoming fiscally sound and secure. But as long as Dems keep fighting old wars and allowing the GOP – and the monied class – to set the agenda and dominate the national conversation, a new progressive movement cannot take place. A new TR cannot rise to the top until the nation is ready for a new progressive era. Thus, the job of every Dem should be to promote and discuss new, progressive ideas. An independent project of the Tampa Bay Times, Poltifact scored Team Romney’s latest campaign ads and statements in 19 different statements as “pants on fire.” The list and graphics are too extensive to post so go here to see them for yourself. So, let me ask you this question: If you reward Romney by electing him president, how could you trust a President Romney to tell you the truth when he’s learned, from you, that lying works? Maybe the morals and ethics – personal integrity and honor – of the nation have changed since my parents, grandparents and Church taught me the difference between right and wrong and to behave with integrity, honesty and honor. Romney is of my generation and my age so I know he was taught these same values. Yet, he has chosen, in this campaign, to disregard all he was taught while growing up about central personal values. I’m not so naive to believe that politicians always tell the exact truth. They shade and spin the truth to their advantage. But to vote for someone who blatantly lies on a regular basis seems inconceivable to me. How could you ever possibly believe he would be truthful with you once he’s elected? 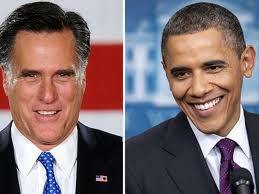 I am appalled that national polls show Romney tied with Obama. Are Americans really so easily misled and naive? Or is the hatred for Obama so strong, even though his policies saved the nation from another devastating Great Depression, that even a serial liar is an acceptable alternative? When I first read this story in The New Republic, I was shocked and disgusted. Now, I’m disgusted and appalled. As you may have heard, Romney on Thursday scared the bejeezus out of Ohio autoworkers when, during a rally, he cited a story claiming that Chrysler was moving Jeep production to China. Thousands of people work at a sprawling Jeep complex in Toledo and a nearby machining plant. Many thousands more work for suppliers or have jobs otherwise dependent on the Jeep factories. It’s fair to say that they owe their jobs to President Obama, who in 2009 rescued Chrysler and General Motors from likely liquidation. If Chrysler moved the plants overseas, most of those people would be out of work. The story turns out to be wrong. As Chrysler made clear the very next day, in a tartly worded blog post on the company website, officials have discussed opening plants in China in order to meet rising demand for vehicles there. They have no plans to downsize or shutter plants in the U.S. On the contrary, Fiat, the Italian company that acquired Chrysler during the rescue, just spent $1.7 billion to expand Jeep production in the U.S. That includes $500 million to renovate and expand the Toledo facilities, with 1,000 new factory jobs likely to follow. On Monday, about the same number of people will report for their first day of work in Detroit, when Chrysler adds a third shift to a Jeep plant it operates there. Obama took GM and Chrysler into bankruptcy, and sold Chrysler to Italians who are going to build jeeps in China. Mitt Romney will fight for every American job. Although the statements about Chrysler are true individually, together they imply that the Obama Administration’s action led to the outsourcing of American jobs. That is obviously false, both in the specific sense of what Chrysler is doing and in the more general sense of what the entire auto industry is doing. Just look at the numbers (or the graph below). According to the Bureau of Labor of Statistics, the number of autoworkers fell almost in half between 2002 and 2009, from around 1.1 million to around 600,000, as the industry was in something like a death spiral. 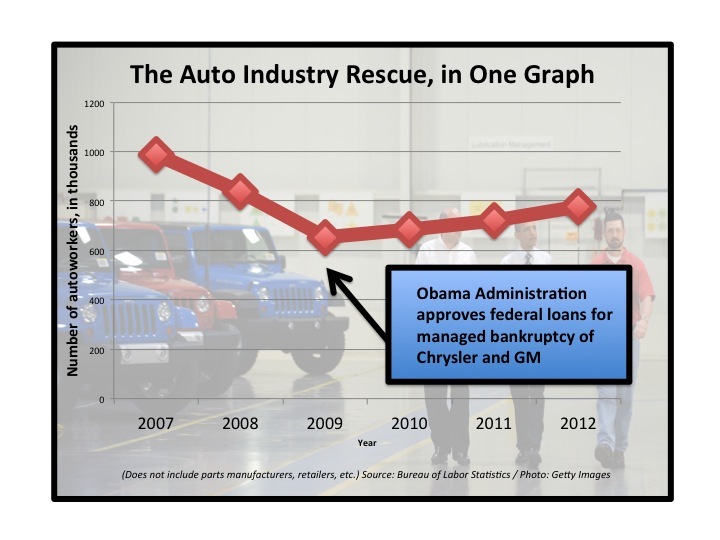 Then, as Chrysler and GM were on the brink of true collapse, the Obama Administration stepped in with federal loans and a managed bankruptcy. Almost immediately, the automobile manufacturing sector started growing again. Since July, 2009, the workforce has risen by about 150,000 jobs and that’s purely in manufacturing. If you include parts manufacturing and other related jobs, it’s 250,000. And that’s the net increase. By providing Chrysler and GM with the financing they needed to avoid liquidation, the Obama Administration prevented those companies from putting more people out of work. Overall, according to estimates by the Center for Automotive Research, the rescue probably saved at least a million jobs. Throughout the primary campaign, [Romney] joined other Republican candidates in a chorus of bailout-bashing and union-bashing when the auto bailouts came up, painting the Obama administration’s crisis-management effort as a reckless campaign to run up the national debt and do favors for labor unions. 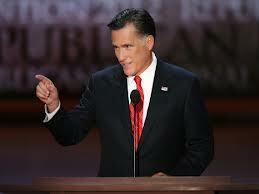 Romney and the Republicans were wrong then and they are still wrong. But Romney has gone beyond normal political bounds. Politics is often a dirty, nasty business, and politicians do lie and mislead. However, Team Romney chose to go well beyond the bounds of normal decency with this blatant attempt to scare workers with closure of their plant – and loss of their jobs – when no such plans exist in order to win votes. With this ad and similarly misleading talking points, Romney has exposed his complete lack of principles and ethics. He has stepped well over the boundary of decency and proven that he will say and do anything to achieve his desired goal of becoming president. The final question remaining is if Romney is elected president how many other unprincipled lies and deceits will he conjure to achieve his own ends. Where is his conscience and what are his ethics? I’ve been watching politics, in particular presidential politics, since the Nixon-Kennedy debates, and I have never seen a more deceitful, unprincipled campaign as Romney’s. Even Nixon’s paranoia and criminal campaign did not disgust this much. Team Romney’s unprincipled attempt to scare workers with the loss of their jobs for purely self-interested reasons should be enough to disqualify Romney. There is no excuse – none whatsoever – for deceptively scaring workers with the loss of their jobs. It’s sleezy, disgusting, and reprehensible. Additional Note: I hope my readers will send this blog or the links to their friends, especially to those in swing states. Romney is not qualified.